The Calendar Feed allows your Next Actions to be automatically pushed to the your Google calendar. 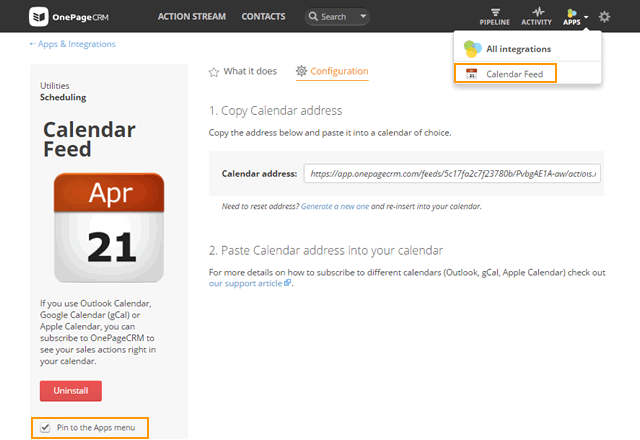 This integration can also be enabled for Outlook.com / Outlook 365 Calendar and Apple Calendar (iCal). 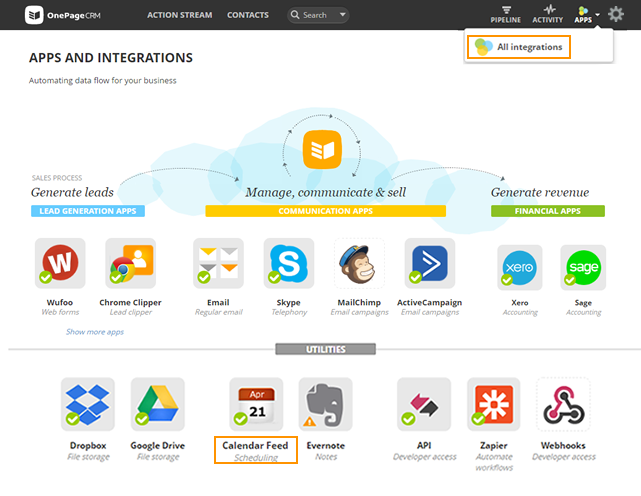 Go to Apps → All Integrations → click on the Calendar feed icon under Utilities. On the Calendar feed page, click on the Install button. Under the configuration tab, Copy the Calendar address and paste it into a calendar of choice. Note: If required to generate a new URL, click on Generate a new one link and copy URL again. In the left column beside Add calendar, click on the menu (dotted icon) to open drop-down list. From the drop-down list select From URL. Paste the copied Calendar Address URL into the URL of calendar field → click Add Calendar. Your sales actions will now appear in your Google Calendar. To pin the Calendar feed icon to the Apps menu, select the check-box: Pin to the Apps menu. It is not possible to manually set how often the calendar is refreshed. Next Actions with a specified Date & time are assigned that date & time in your calendar. 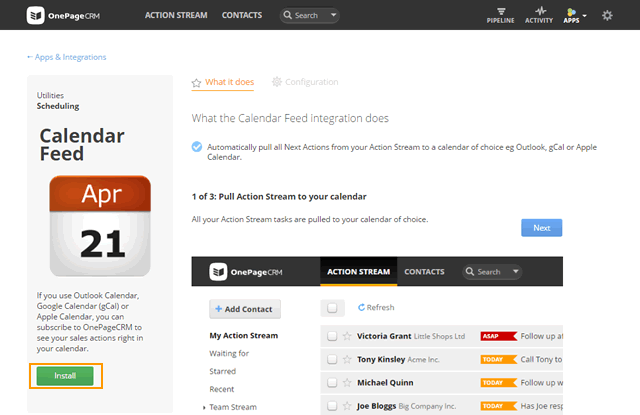 Next Actions with no specified time are displayed as all-day events.